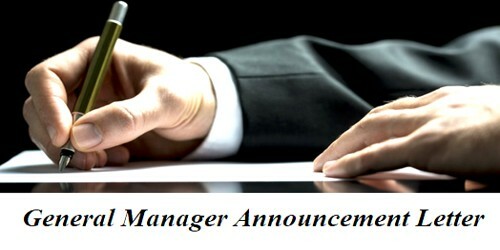 It gives me immense pleasure to announce that (New General manager name) has joined our organization in the position of a general manager (Job designation0. (New General manager name) brings over 10 years of work experience as a manager and general manager in reputed organizations. (Describe in your own words). S/he has played an instrumental role in uplifting the brand image of various organizations and bringing them to prominence. (Job responsibilities). We hope that she shall implement his/her terrific managerial tactics to increase the productivity of our organization so that we can make the most of our resources. (Explain all about the situation). It was necessary for the well-being of our organization that a deserving and eligible candidate fills the vacant position of a general manager. I can assure you that s/he is the best candidate our organization can get for this position. I am sure that her work experience and professional skills would benefit our organization. (Describe your requirements). I would also request all the employees to co-operate and follow the directives issued by (New employee name). It gives me immense pleasure to announce that (New General manager name) has joined our organization in the position of a general manager (Job designation). (New General manager name) brings over 8/10 years of work experience as a manager / general manager in reputed organizations. S/he has played an instrumental role in uplifting the brand image of various organizations and bringing them to prominence. (Job Responsibilities). We hope that s/he shall implement his/her terrific managerial tactics to increase the productivity of our organization so that we can make the most of our resources. It was necessary for the well-being of our organization that a deserving and eligible candidate fills the vacant position of a general manager. I am sure that her work experience and professional skills would benefit our organization.